No Sanctions! Hands off Venezuela! Adding yet another provocative act to the U.S. government’s long history of aggression against Venezuela, the House of Representatives overwhelmingly approved by voice vote a bill imposing sanctions on Venezuela and prominent Venezuelans. 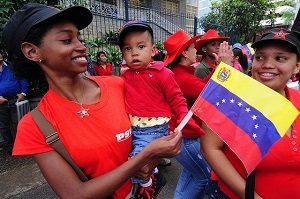 The ANSWER Coalition is outraged at this development and is committed to continuing to mobilize in solidarity with the country’s Bolivarian Revolution, led by President Nicolas Maduro. The proposed sanctions, which are yet to be passed in the Senate or signed by President Obama, are meant to support the ongoing campaign of fascist violence being unleashed by the right-wing Venezuelan opposition. These forces represent the old elites who lost their positions of economic and political power as a result of the country’s revolutionary process. The U.S. government, corporate media outlets and pro-imperialist NGOs like Human Rights Watch have been promoting a false narrative of repression committed against peaceful protesters. In reality, the country’s security forces have exercised extreme restraint in the face of terroristic street blockades that infringe on the population’s right to free movement. The majority of deaths have been of either security force members or innocent bystanders who were caught up in the opposition’s violence. This comes in the context of an economic war being waged by what remains of the country’s business elite. Far from being a product of government mismanagement, the high inflation rates that are so often talked about in the corporate media are the result of a deliberate attempt to destabilize the situation and weaken the government’s support base among poor and working people. U.S. imperialism followed essentially the same script when it decided to “make the economy scream” in Chile prior to the 1973 coup that installed the fascist regime of Augusto Pinochet. Should they be enacted, the sanctions that passed in the House of Representatives will add to the perception that the situation is spiraling out of control. The bill also includes more funding for the Venezuelan opposition, which already receives huge amounts of money from the U.S. government via a labyrinth of “civil society” shells. The Bolivarian Revolution has already delivered stunning gains to the country’s poor and working people. By confronting western and corporate interests, massive progress has been made in the areas of healthcare, education, poverty reduction, housing and more. For the first time, the oppressed have control over their own destiny through institutions of people’s power such as communal councils and communes. It is critical that all progressive people mobilize to defeat these sanctions and defend Venezuela’s right to self-determination.